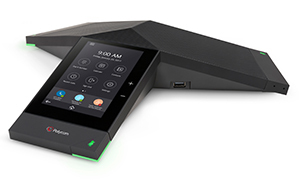 Towards the end of 2015, it was with great joy that the world welcomed the Polycom Trio 8800 conference room device into being. 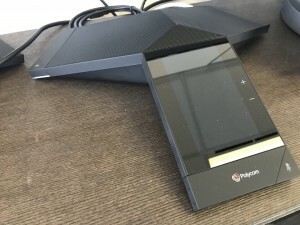 Prior to this, the conference phone of choice for Lync/Skype for Business deployments was the Polycom CX3000: a somewhat ageing platform that was still running Lync Phone Edition software, which Microsoft is no longer actively developing. 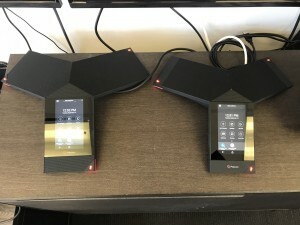 Under the hood, the new Trio was running a version of Polycom UCS software, which also supports Polycom’s range of Lync/Skype for Business certified VVX handsets. We now had a conference room device that no longer relied on Microsoft’s Phone Edition software. As well as being a welcome update, the Trio 8800 also had a few surprises. At launch, it was discovered that not only was the Trio 8800 an audio device, but pair it with a Visual+ module and USB camera, it was also video capable. This fit well with Polycom’s mantra at the time (make every space a meeting space), as the Trio came in at the right price point and feature set to ensure organisations would be more inclined to enable enable smaller spaces for video conferencing that may have otherwise not been enabled. Enter the Trio 8500. Slightly more petite than the Trio 8800, the Trio 8500 is built with a similar aesthetic to the 8800. Hard black plastic with smooth glass edges, it’s pretty much the standard for conference phone look and feel, and the venerable old ‘spider phone’ is synonymous with conference phones. We’ve had a Beta unit for approximately a month and have been putting it through its paces both in our own environment and with a few customers. 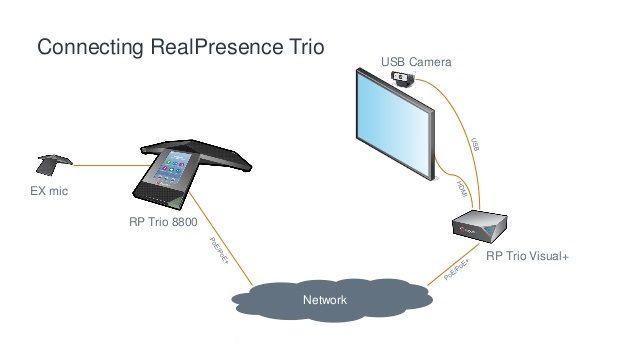 The new Trio 8500 is definitely suited as a direct replacement for any customer that was buying CX3000 Conference Phones – the differentiator being that users that want a more premium audio/video experience with more extensibility for more features and camera support will need to buy the Trio 8800, specifically around AirPlay and Miracast support. Below you can see some close ups of the Trio 8500 unit itself, as well as a comparison shot of a Trio 8500 versus Trio 8800 in size. Secured USB Cable – great move! All in all, a great addition to the family and will provide your standard conference rooms with quality audio on both transmit and receive. 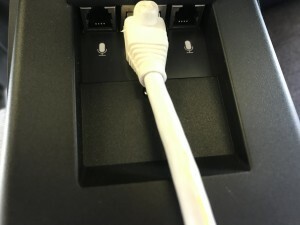 We really love the secured USB cable (a bugbear with the Trio 8800) ensures you won’t lose the USB connection if someone wants to use the unit as a USB speakerphone. 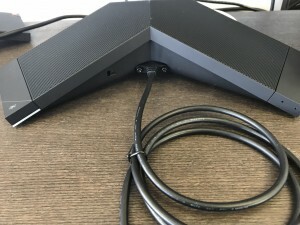 The lack of additional Ethernet ports will annoy some customers, but most of our customers are happy not to provide Ethernet connectivity to conference rooms that are used by both internal and external staff. As always, if you need assistance with working out the right device or experience for your organisation, get in touch! This entry was posted in Lync 2013 and tagged Skype for Business, Polycom Trio, Polycom Trio 8500. Bookmark the permalink.